Kronos is a game with an Ancient Greek inspired theme, which seems to be built around the titan god with the same name, father of Zeus and ruler or the Titans during the Golden Age in mythology. He was overthrown by Zeus and then he was kept in Tartarus. The theme would normally be a good one, but the implementation of the design is simply awful. The bright blue reels, combined with the card suits icons, give the game an older look which I’m not a fan of. The symbols which are themed look good, but the design is ruined by the others. 5 reels are present in Kronos, and the number of paylines on them reaches 20. 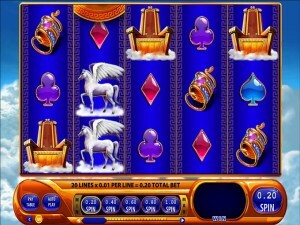 The game promises prizes as high as $2,250 and as features you will find the free spins, the scatters and the wilds. 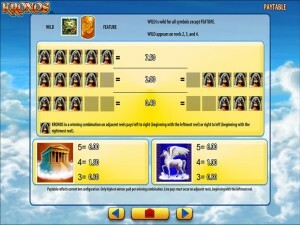 Playing Kronos means getting access to wild symbols, to free spins and the scatters which will trigger them. First, let’s take a look at the wild symbol, which is the kind that can’t give you prizes and which is also limited to only a couple of reels. A wild may only appear on the reels 2, 3 and 4 of the game. From those positions, it can replace other icons if it’s on the right payline, and that’s about all you can expect from it. Wilds will not replace scatter symbols, but that’s not unexpected. Speaking of the scatters, these symbols come with a K logo on them, and they may appear everywhere in the game. If you have enough of these symbols on the reels means that you can start playing the game for free, the slot offering you between 10 and 100 spins that you don’t have to pay for. You need only three scatters to get the minimum of 10 spins, four to get 25 and all five to get the maximum of 100 free spins. These spins have extra wilds added to their reels, so the odds of winning a decent amount of money are improved. You can get 3+ scatters as the free spins are running, and if that happens the free spins are retriggered. You always use the maximum number of coins you can, which is 20 for just as many lines. You can only modify the wager by changing the coin’s denomination, from an initial value of $0.01, going as high as $3. The biggest bet possible is $60. Your best prize will not go higher than 750 coins, which in this case would mean up to $2,250. As you could probably tell from the intro, I’m not a big fan of the slot’s design. It has some very good things about it, like the background with the white fluffy clouds, or the symbols which are themed, but it’s ruined for me by the old looking reels with a bright blue on them, and by the card suits icons. 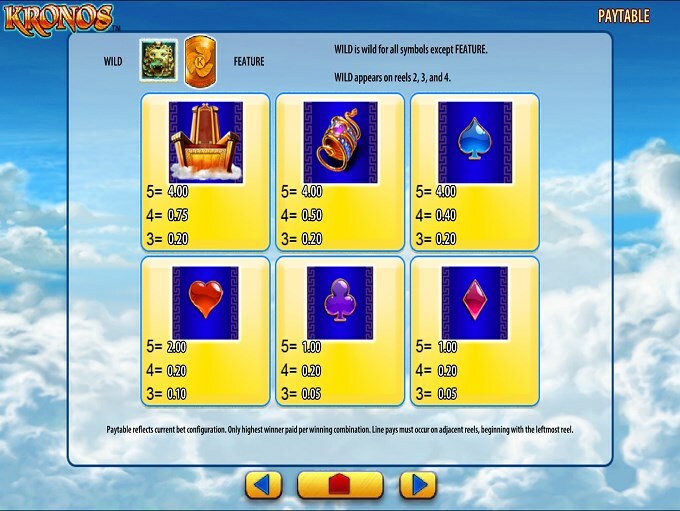 Symbols: Gold Sun (wild), Kronos Logo (scatter), Kronos (750 coins), Temple (600 coins), Pegasus (600 coins), Throne (400 coins), Bracelet (400 coins), Spades (400 coins), Hearts (200 coins), Clubs (100 coins) and Diamonds (100 coins). I’m not a fan of the design of the game, even though the theme has some potential of being interesting. The features are also in the average range, so all things considered, play it if you’re not bothered by the design quality. 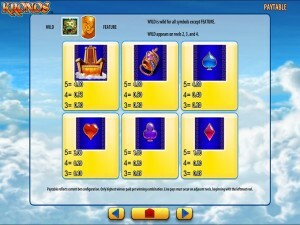 The Kronos slot machine is offered through the WMS platform, so if you want to play it for real or just to practice, look out for casinos that use it.